Inner storage space of 16" x 13" holds pens, wallets, cell phones, tablets, even laptops up to 15"
How easy is it to install the Slim Under Desk Storage Drawer? Very easy! The drawer is installed to the underside of your desk via 4 wood screws. Just line up the drawer so that it's flush with the front edge of your desktop, then use the included screws to attach it to the desktop. If you decide to add the included, but optional brackets, you'll also have a few machine screws to work with, which will allow you to install your drawer on desks with limited depth, like our 24" depth desktops. How does this drawer work? After installing the Slim Under Desk Storage Drawer, this drawer is ready to use! The drawer holds items up to 15 inches square, while a single key locks the unit for more security for your personal things at your workstation. 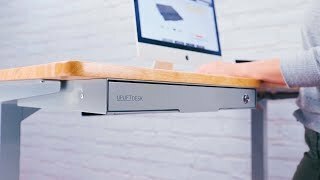 Will the Slim Under Desk Storage Drawer fit under my desk if I already have a keyboard tray installed? In most cases, yes. This depends on a few things, like the size of your desktop and the amount of accessories you already have installed, and their placement under your desk. If you have questions about your setup, call our Support Team and we'll be happy to help point you in the right desk storage direction. How much stuff will fit in the drawer's inner compartment? This drawer might look slim, but it can hold quite a bit of your stuff, from personal items to laptops up to 15". Although the drawer is low profile, it boasts 208 square inches of surface area in the drawer, which is ideal for storing a multitude of office items. Some random office items we fit inside our drawer: a laptop, a notebook, hair accessories, glasses cases, backup car keys, and even a secret snack stash of chips and chocolate. You'll get your pick of white, gray, and black color options! The Slim Under Desk Storage Drawer is constructed from steel with a powder-coated paint finish. Each drawer is powder-coated inside and out to provide a seamless finish that also very durable. Choose between black, gray, or white to match the frame of your UPLIFT Desk. Inner storage space of 16" x 13" stores items and laptops up to 15"